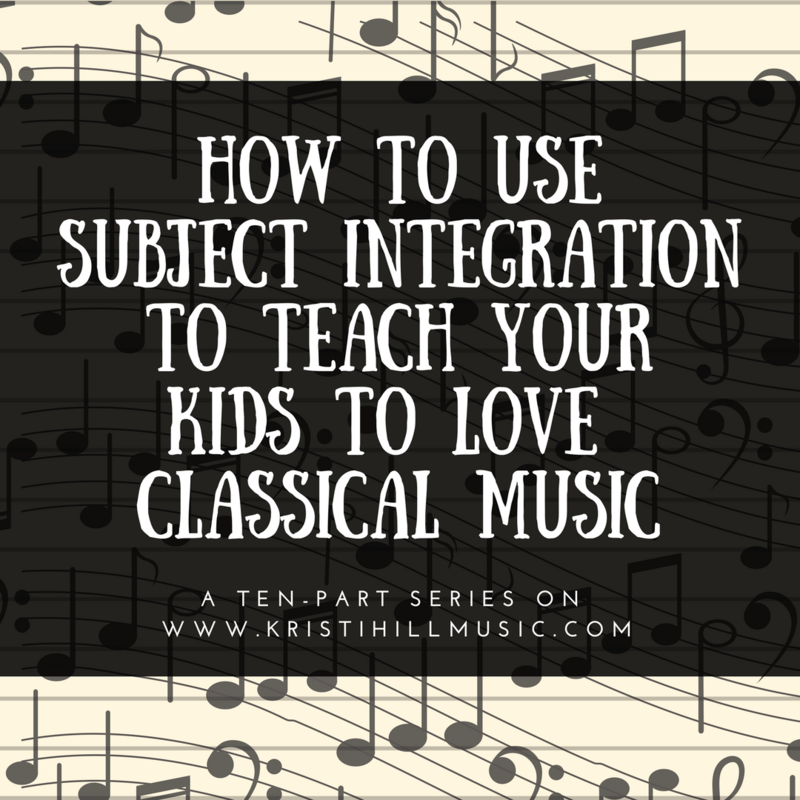 I talk a lot about subject integration here on the blog, and it is a major part of my music curriculum. 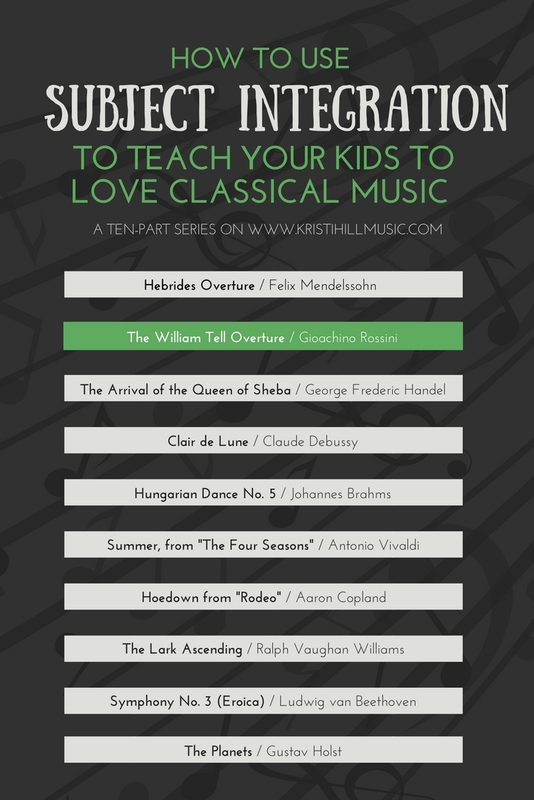 I believe classical music studied in isolation is way too abstract for young children, and subject integration can be your secret weapon when it comes to making music appreciation meaningful to your kids. Hopefully, by the time school starts next year, I will have tipped your thinking toward how you can incorporate music appreciation into everything else you are doing. Music appreciation will easily slip in and out of your lesson plans and your home will be filled with great music that has stood the test of time. Gioachino Rossini is a blast of a composer. He wrote a whole bunch of operas, most of which were pretty good, then he retired young to travel, entertain, eat good food, and spend time with friends. What a good life! I’m jealous. Before Rossini left the world of music to immerse himself in French cuisine, he finished his career with one last opera. It was based on a play about folk legend William Tell. The opera itself is a little neither-here-nor-there at this point. But the overture? That’s where it’s at. Famously used as the theme for The Lone Ranger, the William Tell Overture is such a part of our popular culture you might not realize it is a piece of “classical” music. And it’s so fun and engaging for kids, they will never notice they are actually learning something. Start with your sketching. Then I will show you how to take this piece into several other subjects. Okay, ready for subject integration? Here are some ideas to get you started! William Tell is a Swiss folk hero. It isn’t completely conclusive as to whether or not he was a real person, though. Catch up on the story HERE. Great books are the best subject integration of all. The go-to classic for the story of William Tell is the Newbery award winning The Apple and the Arrow. Because William Tell is a Swiss hero, add a geography moment by identifying Switzerland on a map. Add in some interesting facts for older kids or simple crafts for the little ones. Switzerland is famous for taking a neutral stance in global conflicts. But why? Older children can explore this interesting part of Swiss history HERE. As mentioned, Rossini left composing in favor of great food and good friends. He has a famous drink named after him, and you can have fun making them at home. A Rossini is similar to a Bellini, except strawberries replace peaches as the main ingredient. Make a kid-friendly version by pureeing strawberries with a bit of sugar, then combine the mixture with ginger ale or Sprite. Get your kids in the kitchen to help, then sip your Rossinis while you listen to this great music! And there you have it! 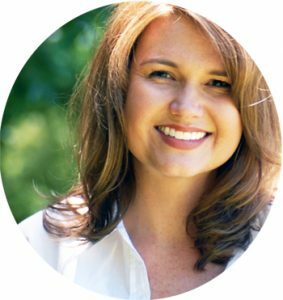 Start with a great piece of classical music, veer into geography, stop by the craft table for little ones, and end up in the kitchen creating a composer-inspired treat. That’s subject integration at its best. Enjoy introducing your kids to this fun piece of music! This website uses affiliate links. That means that if you click and/or purchase anything recommended in this post, a few coins might head my way. It keeps things running around here, so I thank you greatly for your support!